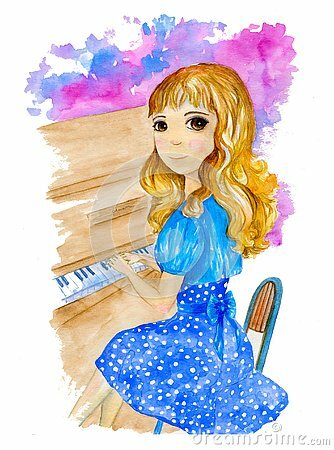 Watercolor illustration about pretty blonde girl in blue dress playing the piano on the colorful background. For use on card, postcard, poster, decoration, design, scrapbooking, paper, banner. Ramadan Kareem arabic calligraphy and lantern for islamic greeting and mosque dome silhouette.